Give Monthly By Regular Mail: Please send your check or money order to Destiny Eastgate Ministries PO Box 711, Camden Maine 04843. By Credit or Debit Card – A convenient way to give regularly is by going to our website and simply click on the “Pay Pal” verified button to your left. This takes you to a secure Pay Pal site where you can donate on line using your credit or debit card. 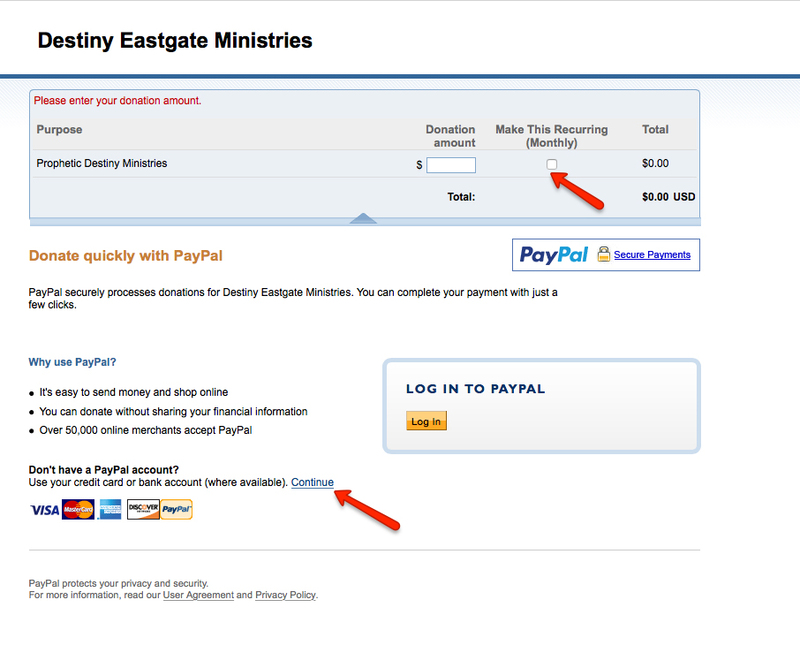 Pay Pal also provides you with a receipt by email as well as our ministry. Simply fill out the information and note “Destiny’s Eastgate Support partner.” Be sure to check the “Make this Monthly” box. Or, call our office at (207) 236-4904 to arrange with us a monthly support payment plan. Thank you supporting the ministry of East Gate House of Glory.